Whether you believe that story, whether Sun Ra believes it, or whether his entire persona is a theatrical put-on should make no difference. 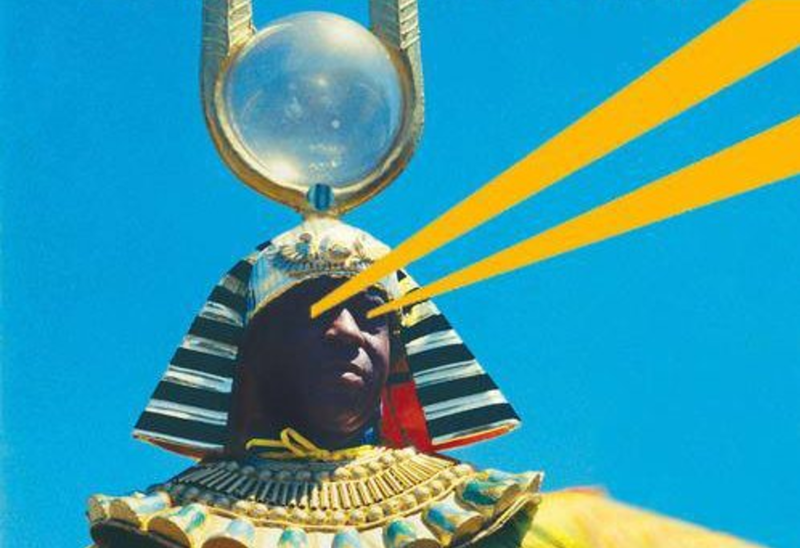 Because Sun Ra would be a visionary either way. Combining Afrocentric science fiction, esoteric and occult philosophy, Egyptology, and, with his "Arkestra," his own brand of free jazz-futurism that has no equal on earth, the man is truly sui generis. In 1971, he served as artist-in-residence at UC Berkeley and offered a spring semester lecture, African-American Studies 198, also known as “Sun Ra 171,” “The Black Man in the Universe,” or “The Black man in the Cosmos.” The course featured readings from—to name just a few—theosophist Madame Blavatsky, French philosopher Constantin Francois de Chasseboeuf, black American writer and poet Henry Dumas, and “God,” whom the cosmic jazz theorist reportedly listed as the author of The Source Book of Man’s Life and Death(otherwise known as the King James Bible).